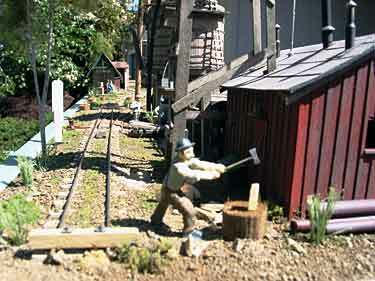 provides more railroading fun than perhaps any other small-layout plan. 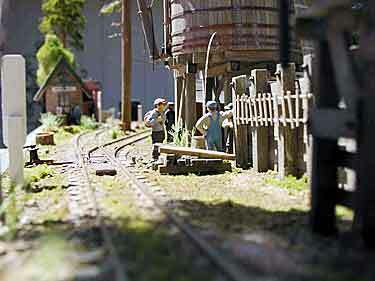 SMALL LAYOUT IN A LARGE SCALE — IT’S A SNAP! 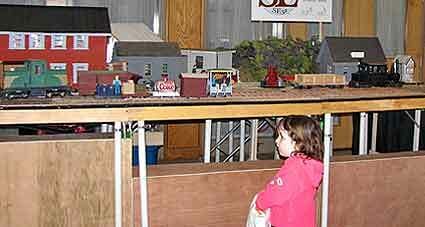 Gerry Snelson (left), from Frostburg, Maryland USA, combined features of several Gn15 layouts featured in these pages to design and build the Shandy Natural Agricultural Products (SNAP) estate railway. Measuring 56×15 inches, the little line is set in the woods of northwestern Maryland and features a 19½in high backdrop. Structures are made from computer printouts using textures found on the Internet. Many of the scenic touches will be familiar to frequent readers, as they’re developed from Carl Arendt’s SAP Line maple-sugar layout. Gerry’s track plan makes good use of tricks from Futtock’s End by Giles Barnabe—there are fiddle areas at both rear corners. 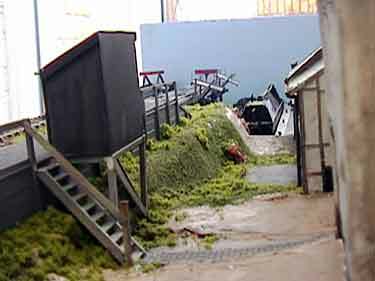 The one at the right end (bottom of right photo) provides a hand-powered runaround capability, easing the switching crews’ chores. Photos are by Jon Snelson, the builder’s cousin, unless otherwise indicated. For more about Gerry’s many activities, see his website. 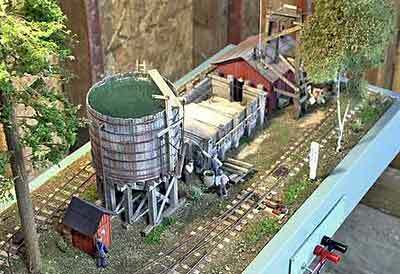 Franck Combe, from Paris, France, is planning a new Gn15 mining layout in a 220x30cm (87x12in) space. As a kind tribute to this site, he plans to call it the Carl Arendt Rock & Limestone Company (Iowa-USA), or Carl Co. for short. He’s planning to use Peco Loco Lifts as cassettes to fiddle traffic in three spots. Franck’s previous Gn15 layout was reported in Scrapbook #74 and at his blog. 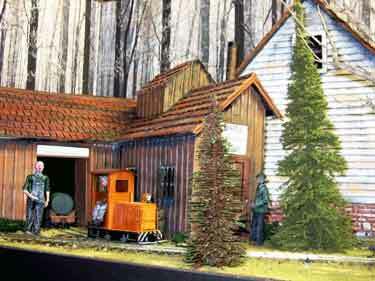 The tiny 1:24 scale layout measures 19½x7in (50x18cm), and it is operated by an inconspicuous pull-string (neither electricity nor locomotive required). For more details see Bob’s website. He also provided a short video that shows the line in operation! 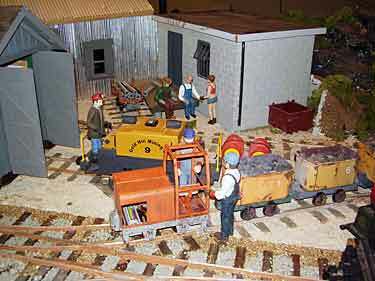 Rick Ludlow, from Medford, Oregon USA, is building his Basche & Wackett On30 railroad as several independent mini layouts, all of them popular attractions at the annual Medford train show. The B&W Maintenance Yard occupies an 84x12in (213x30cm) shelf that just fits into Rick’s office. He built it as a practice exercise in scratchbuilding, but also finds it’s fun to use as a switching layout. We’ll feature other parts of the B&W in future issues. Scott MacLean, who lives in Melbourne, Australia, is building this “window shelf” layout in snippets of free time, using Bachmann On30 stock. The shelf measures 45x16in (114x40cm). Thus far Scott has installed and wired the trackage, so he can run trains, using DCC control so two locomotives can operate for switching maneuvers (necessary as there’s no trackage for running around trains). 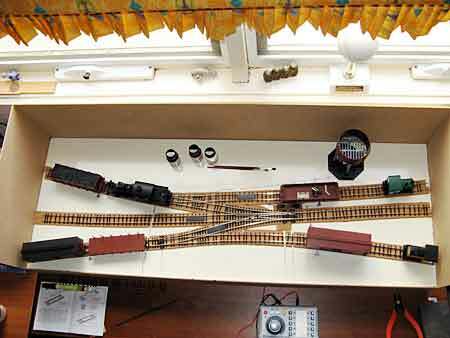 O-GAUGE 3-RAIL SWITCHING LINE IN 3 SQUARE FEET! 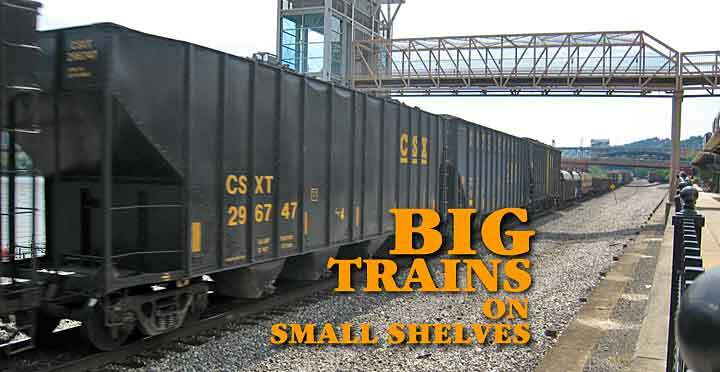 Several readers have asked about micro layouts usable for O-gauge, three-rail trains. Nowadays, these models are very realistic affairs, differing mainly in wheel dimensions from full-scale models. So here’s a layout that might help the space-challenged three-rail modeler: the Punch Transfer Line is an urban switching layout, a lot of fun to run, that uses AtlasO 21st Century O three-rail trackage and occupies just three square feet on a 1x3ft (30x90cm) shelf! It also needs a sector plate or cassette (at the right in the plan) that can be as long as you wish. Layout designer Carl Arendt commented, “I mocked up this little layout (above) on a 1x4ft board (30x120cm) so that I could have a pivot point for the sector plate. But it turned out that a simple cassette worked much better. It attaches to the on-stage spur tracks using three loosened rail joiners. Seems to work just fine. 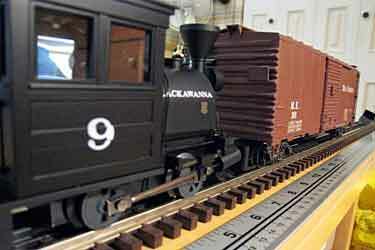 I used an AtlasO 57-inch diameter switch and curve, along with 10-inch and 4½-inch straight sections. The 27-inch radius pretty much limits the line to 40-foot cars and 0-4-0 locomotives, which happens to be exactly what I own! 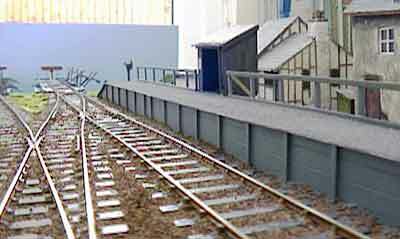 Ashwood Basin is an O-scale standard (normal) gauge layout built on a 108x22in (274x56cm) shelf. 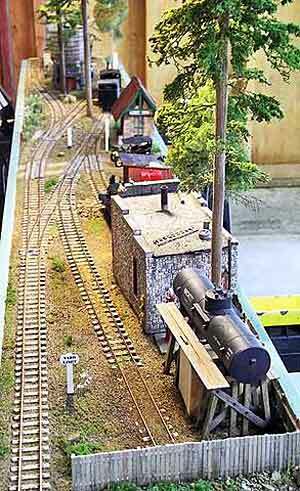 Mike Bragg, from Solihull, England, designed this classic “two turnout layout” as an extension to his Lenches Bridge line (see Scrapbooks #59 and #65a), but plans to exhibit Ashwood as a stand-alone layout. The line is built on two 54in baseboards including a traverser at one end. 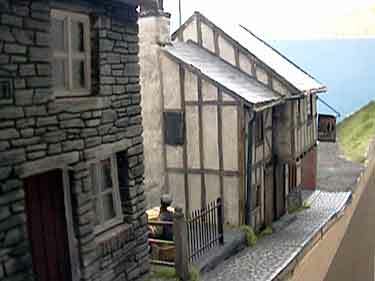 The scenic section covers 72in, depicting a canal basin in the Black Country of the English Midlands (where Mike lives). 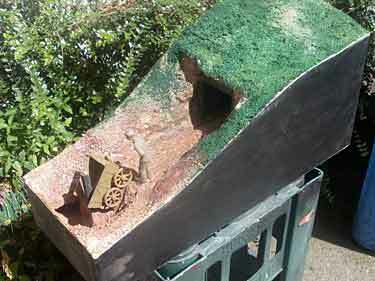 Canal narrow boats and structures are all scratch-built and correct for the area. John Foley, from Hudson, New Hampshire USA, has built a portable shelf layout in a scale normally restricted to large garden railways! He built it to the scale of 7/8in to the foot (1:13.7 proporation), running on G-gauge (1¾in or 45mm) and O-gauge (1¼in or 32mm) trackage to represent two-foot and 18-inch narrow gauges, respectively. These are really BIG trains! Modeling in 7/8in scale is pretty much for scratchbuilders. John’s hand-built locomotives are battery powered and equipped with a timing mechanism to allow them to run from the mine to the processing plant, then reverse and return to the mine. These photos show some of the amazing detail that’s possible to achieve in this scale. They were taken at various local shows in the New Hampshire area—John loves to promote model railroading in general and 7/8in scale in particular! John’s layout is modular for portability, based on 48x30in (120x75cm) modules (diagram below). Currently he operates four modules as a shelf. 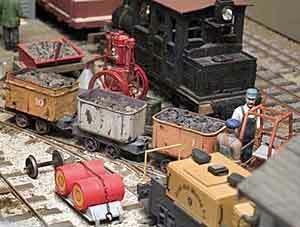 An additional set of modules (grey area at the right rear) holds an oval of track, the mine and a hidden fiddle yard. 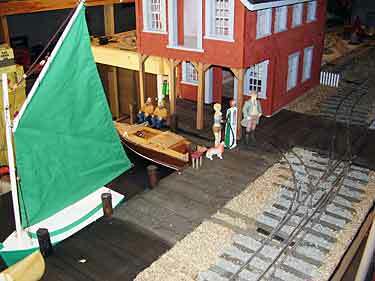 The line is mainly based on the famed Maine two-foot gauge railroads, but the newly-added waterfront area (at the left) is also served by an 18-inch gauge line, giving John the opportunity to show off some dual-gauge trackage. All tracks are hand-built using Code 250 rail on wooden ties. The elevation view at the bottom gives you a feel for the sheer size of these models. The shelf modules total 16 feet long (4.87m), and you can see how little scenery fits in that space! 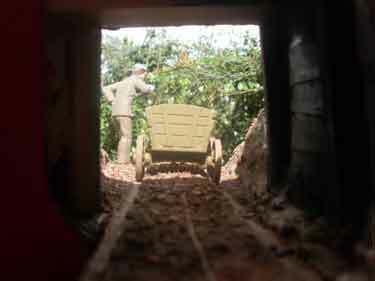 Though this line is larger in area than our usual featured layouts, please remember that this same line built in O scale (1:48) would measure just 54×8½in (137x22cm)!